Stepping Stones Child Care knows infant care! The Stepping Stones Child Care Infant Program is for children age 6 weeks to 18 months, from 7:30 am -5:30 pm Monday to Friday. Extended hours may be available for infants at our Elphinstone location, depending on current enrollment. 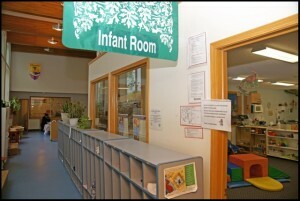 Stepping Stones Child Care has cozy infant rooms for your little bundle! At Stepping Stones Child Care, our Infant Program involves the daily care of the children; diapering, feeding, interacting, playing and outdoor time. We follow the infant’s own schedule. At Stepping Stones Child Care, we know infants need to grow, rest, explore, have tummy time, and eat—and they all do it on their own sweet time schedule! The staff to child ratio is kept deliberately low at Stepping Stones Child Care, as this is highly beneficial to the development of your baby during this crucial first 18 months of their life. Our 1 staff for every 3 children ratio in the Infant Program also adds to the safety and comfort of the babies in our care. 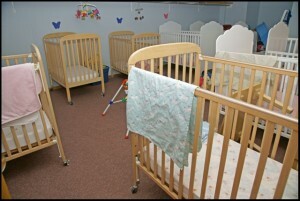 Cozy cribs await your sweet infant at Stepping Stones Child Care Co-operative! Our staff completes a daily sheet that includes helpful information such as feeding: what your child ate; how much they ate and at what time; diapering and sleeping times, along with the various activities they participated in throughout the day. A copy of this sheet is sent home each night with your infant. This is a great way to be part of and see all the amazing changes and growth that occurs during this wonderful segment of your baby’s life!